Anyone can suffer from the pain of joints. Most of the time it can occur due to growing age, unhealthy eating habits, weather changes or some other factors. For the same in different people reason can also be different, but solution can be one. 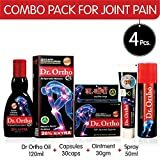 Whether you are suffering from the joint pain, leg pain, shoulder pain or knee Dr. Ortho pain reliever ointment can help you in all the ways. Dr. Ortho pain relief gel can help you in solving your pain associated with neck, knees, back, and shoulder. It is the best pain relief spray can be used for treating neck pain, knees pain, joint pain, and leg pain. Dr. Ortho pain relieving ointment is the mixture of 10 effective herbs that is helpful to treat cause of joint pains. The therapeutic properties of medicinal herbal oils and plants helps in relieving pain related to muscles and joint pains of neck, shoulder, legs and back without any side effects. The main elements of it are Gaultheria Oil, Menthol Crystal, Camphor Crystal, Nilgiri Oil, Clove Oil, Turpentine Oil, Ajwain Oil, Cinnamom Oil, Katuvira Oil, and Capsicum Oleoresin-5%. Dr. Ortho pain relieving cream absorbs well in the tissues and gives you prolonged relief from the stiffness in joints. Dr. Ortho is safe to use and person of any age can use it to get the relief from the joint pain. It’s an easy formula that helps you get the relief from the severe pain that has been making your life tough for several years. What are the essential instructions and cautions to use Dr. Ortho Ayurvedic Oil and Capsules?